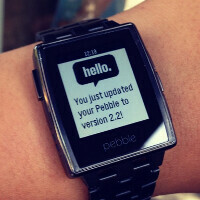 The Pebble smartwatch has just received a firmware update to version 2.2. As a result, Pebble owners can now control the volume of music coming from the timepiece on their wrist. While in the music app,hold down the select button to launch the volume controls. The update also allows you to re-order the apps in the launcher menu. Once again, holding the select button is the key to your freedom. Other changes include the redesign of the aforementioned music app. A track progress bar has been added so that you can see how long a song has to run. Issues with the app's layout have been taken care of. For those who have been having trouble getting up in the morning, the alarm will now vibrate for 10 minutes instead of the previous 1 minute. And what would an update be without the usual bug fixes and stability improvements. Those using their Pebble with an Apple iPhone not only need to update the Pebble firmware to version 2.2, they also have to update the iOS Pebble app to version 2.2.This update will support the music control buttons found in the firmware update, and will also support iBeacon. In addition, Bluetooth LE can be set up to allow the Pebble wearer know when he is close to an iOS user. The Pebble Firmware update can be found once you open the Pebble smartphone app. The iOS Pebble app update is found in the Apple App Store. I'm trying out a Pebble smart watch accessary for the next 30 days. I can say I see an improvement since the initial firmware. Caller ID name if contact is stored in my phone now is pushed to watch. The biigest benefit is I can leaving it charging in another room and know where or not i need to rush when the phone rings. I'm looking forward to this October if Apple finally has the iwatch ready for sale. UPDATE: Just returned Pebble smartwatch can't justify very limited accessory for the cost.